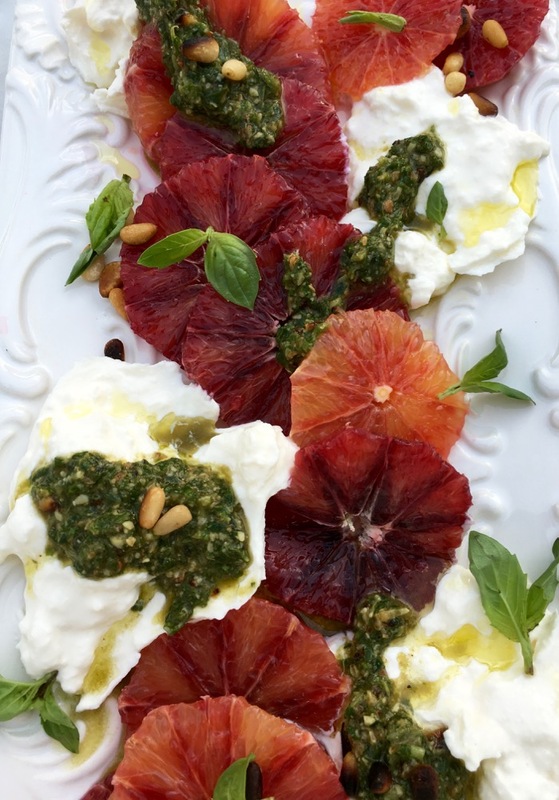 An Italian blood orange salad recipe with creamy burrata cheese, basil pesto and pine nuts. 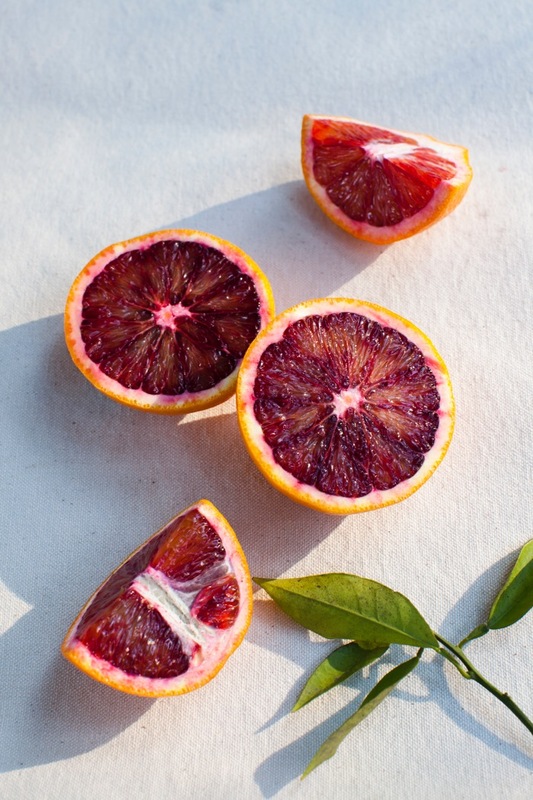 How can one resist the perfection of blood oranges ? I look forward all year long to this short time in the year when blood oranges grace us with their presence. Do I really need go on about my obsession with creamy burrata again you guys ? Can you even take one more rant from me about the insanity that burrata cheese is and that I can not say no to anything involving burrata ? You would think burrata cows are endorsing this blog, because not that long ago I was talking burrata and peaches like THIS recipe, burrata and roasted tomatoes like THIS, burrata and bruschetta like THIS. Let me count the ways I love burrata, but maybe not today, not again. I will focus on my other seasonal love for blood oranges, and in particular my fondness for this blood orange salad. Check this for a moment ! All i really had to do what slice things nicely, and buzz up some pesto in my mini food processor. Pretty basic stuff, yet unless you have great quality ingredients it won’t be as amazing as what I’ve experienced. I hope that makes sense. Try to get a mix of firm blood oranges at the market If you can, both the look and the flavor is different, which enhances the final flavors of the dish. However, for the Batman I made mini grass fed burgers that i then topped with the blood orange salad and burrata and drizzled them with pesto. Just like that, no bun, open face tiny bites of awesomeness. At least he says so. Either he is telling the truth or just afraid I won’t feed him anymore and so he keeps buttering me up. Not my problem ! 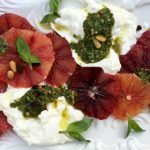 This is my story and i’m sticking to it: this blood orange salad is everything, If you are into blood oranges and a burrata freak like yours truly. Otherwise I guess you are on your own and totally missing out ! Using a sharp knife peel the blood oranges and cut them into thin slices. Pat dry the burrata cheese and using your fingers tear it into big pieces. Place on a serving platter and surround with the sliced blood oranges. Make the basil pesto. Add the 2 cups of basil leaves, garlic, pine nuts and the olive oil to the bowl of a food processor. Process until smooth and transfer to a bowl. Stir the parmigiano reggianno cheese into the pesto together with the lemon juice. Adjust seasonings to taste with sea salt and more lemon juice. 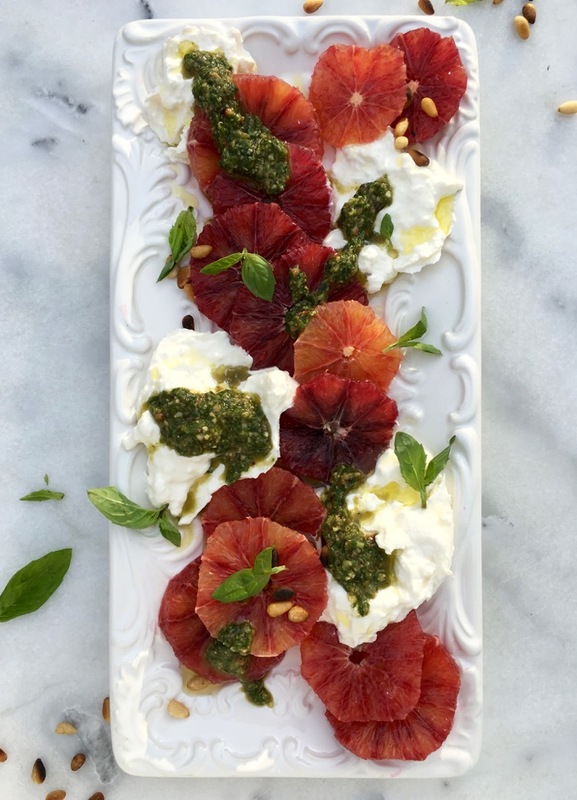 Spoon the basil pesto over the blood oranges and burrata, sprinkle with the pine nuts and garnish with the basil. This is my type of appetizer, or even meal, so flavorful, colorful and delicious! I don’t even need an entree, this can be it for me. Burrata is everything, forever and ever Amen ! This looks fabulous! I would eat a salad like this every day!! This dish has me thinking I should become a vegetarian too. 🙂 Its absolutely beautiful! Anna, this is the best part about being a vegetarian. 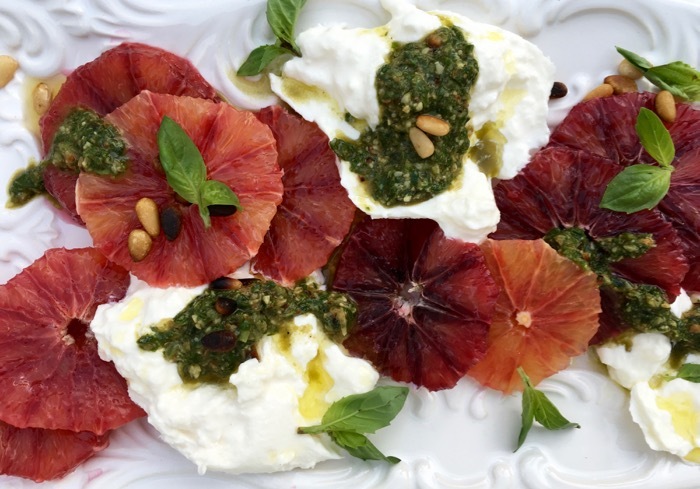 I never deny myself burrata, and I can have unlimited about of blood oranges. Makes up for the lack of meat. This salad looks beautiful on the plate and I bet it tastes even better than it looks. I’ve never tried a salad like this before but now it’s on my want-to-try list. It’s so much fun to experiment with new ingredients and flavors. I really hope you try it! 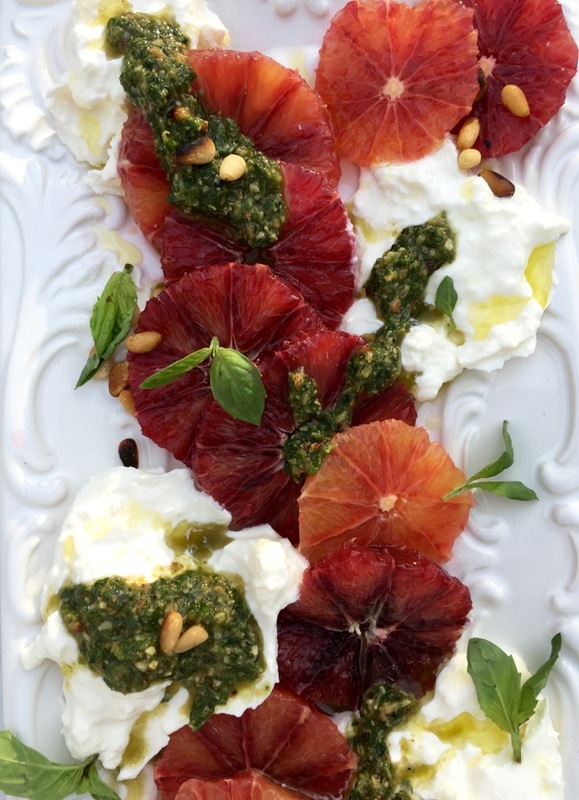 So easy and quick to make, but the flavor profile from the blood oranges is to die for. Just nature showing off again ! Hi Jennifer, you should find them at your local grocery store between January and March. If you don’t just use a mix of regular sweet oranges and pink grapefruit. That’s really what blood oranges are, a cross between grapefruit and orange. This sounds like a delicious salad. I love that you used blood oranges in it. Yummy! !